This summer, the Boys & Girls Club of Washington County brought back a program designed to help get teens ready for their futures, while also benefiting the community. Partnering with Bester Community of Hope, Tomorrow’s Leaders pays teenagers a stipend to work at the Frederick Manor Club summer camp and arranges volunteer work at the Boys & Girls Club’s Elgin Station. The Boys & Girls Club runs four after-school programs and summer camps for those 6 to 18 years old throughout Washington County. Bester Community of Hope is an initiative of San Mar focusing on the children and families in the Bester Elementary School neighborhood in Hagerstown. A version of the program existed from 2003 until a few years ago, but funding issues led to its dissolution. “Rebooting the Tomorrow’s Leaders is part of our plans to offer more services for our teens, as it is a gateway to official future employment,” Addie Nardi, Boys & Girls Club executive director, said in a news release. The program, the third of seven weeks of which is finishing up, required the teens to apply and go through an interview before being picked. The job-readiness test they took prior to the program will be compared to one given later to check the effectiveness of Tomorrow’s Leaders. Four participants are working at the Frederick Manor Club summer camp one day a week each, and three St. James School students are helping out at Elgin Station during two- and three-week shifts. Rollins was a participant during the inaugural program and said getting to see a new generation of leaders be affected by its guidance has been special. Kerry Fair, Bester Community of Hope program manager, said she already was asked by the kids if they can expand the program throughout the school year. She said they are trying to work something out to continue past the summer. Daily tasks include assisting the staff, mentoring campers and providing a safe atmosphere for the kids. For the teens, the main draw wasn’t the money, getting in some student service learning volunteer hours or even the work experience. It was the children. Ashia Jones, 16, was going to volunteer anyway, since her brother is involved at Frederick Manor. The small stipend and other Tomorrow’s Leaders benefits just helped sweeten the deal. 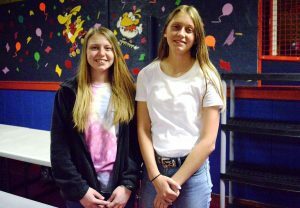 Friends Kiandra Houser, 16, and Danielle Wolf, 15, were already involved with the Boys & Girls Club and jumped at the chance to work with kids. Kiandra said she wants to be a family therapist when she gets older, so the experience she is getting now with Tomorrow’s Leaders is setting her up for success. Danielle plans to become an elementary school teacher. “I just think it’s a good opportunity for teens. It’s also a good opportunity for kids … especially a program like this. Sometimes they don’t have people to talk to at home and they might be able to relate more to us than adults,” Danielle said. Another Boys & Girls Club veteran, Shada Datcher, 16, loves not only working with the children, but gaining experience to help guide others. “We’re representing tomorrow, the future. We stand out. We are people that are leading the pack, so we’ve got people looking up to us, following us,” Shada said.